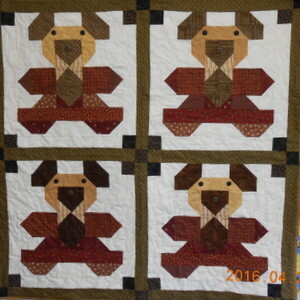 This teddy bear quilt measures 46 x 46 when completed. Can be made to be used as a quilt or wall hanging. We used the new line of Kansas Troubles fabric from moda to make this adorable piece. Machine pieced and embellished with buttons. Can be made as a 4 week class while the project lasts . Call or email the shoppe if interested. Kit available in store or in our online store.